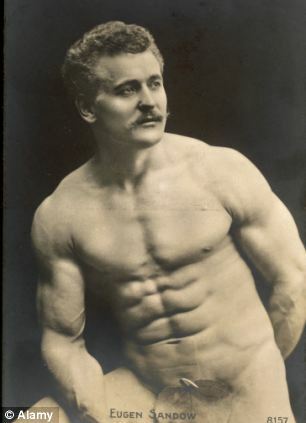 Eugen Sandow's status as an inspiring influence in the physical culture world has never been surpassed. When at his zenith as an athlete his extraordinary abdominal development was a most outstanding part of his much admired physique. This celebrated strongman, who still ranks as a demi-god to innumerable persons, is an outstanding example of the fact that there is a vast difference between a well developed and symmetrical abdomen and a merely small waist. When the renowned Dr. Dudley A. Sargent of Harvard University measured Sandow in his prime, it was found that the difference between the girth of the waist and the circumference of the normal chest was a fraction less than 11.5 inches. The well conditioned waist of Henry "Milo" Steinborn very likely may appear thick from the now prevalent view of body builders. Yet actually the mid-section of this superman is an harmonious part of his impressive physique. 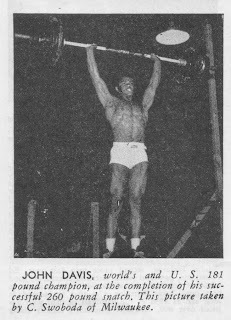 Unquestionably if his waist had been undersized he would not have astounded the strength world by smashing world's weight lifting records. The late Alan Calvert is one of the eminent physical culture authorities who called attention to the fact that a "wasp-like" waist, which so many of the present day body builders strive to attain, lessens the strength of the body. Many followers of weightlifting have questioned me about my recent gain in bodyweight. Of course, their reactions have been pro and con. These queries, plus the fact that Harry Paschal and Art Gay have taken it upon themselves to "analyze" my "unusual" lifting and physical condition at recent contests, prompts me to write this article - both in defense and in explanation. Now, it is my contention that one can not present a "Mr. America" appearance and perform record-breaking lifts. To be explicit, a lifter can not have the slim waist of Steve Reeves, the sharply defined muscularity of Yas Kuzuhara, and yet make presses of as much as 100 pounds or more in excess of bodyweight. I don't disapprove of the above mentioned physiques. Kuzuhara possesses the finest physique of any small man I have ever seen. But these types of physique are good only for the purpose for which they are developed - for display. The theory on which this article is based has its exceptions, as do most theories. However, this does not necessarily present argument for the "cons." There are men, such as Stanczyk and Ishikawa, who may be termed the exception to the rule. In direct contrast, we have John Terry. Comparing Terry and Ishikawa, we find Ishikawa is the better stylist and the more consistent jerker of the two. However, Terry when lifting was the superior all-around strongman. But Terry was a poor jerker because of a slim waist. He could and did clean 290 pounds, but couldn't jerk it because of a 25-inch waistline. But speaking generally, since it is an accepted fact that a small man is proportionately stronger than a heavy man, very little can be said for or against excess weight and thick waistlines in the lighter bodyweight classes. It is far easier for a small man to clean and jerk double bodyweight than it is for a heavier man. To prove this point, let us examine the records. Of 79 contestants in the 1946 World's Championships, 18 were featherweights. Among these 18 lifters, 8 clean and jerked double bodyweight. Of 18 lightweights in this tournament, 5 clean and jerked double bodyweight. There were 15 middleweights in this championship meet and only 3 clean and jerked double bodyweight. Scores of lifters weighing up to the lightweight class have clean and jerked in excess of double bodyweight. As we look at the middleweights, the percentage of men who have performed this feat dwindles. In our most recent World's Championships, we find that out of 42 contestants only 7 performed double bodyweight clean and jerks. Of these, 2 bantamweights accomplished this feat. I say 2 because the third man to perform this feat was a 112-pounder, Antonio Santos of Cuba, who clean and jerked 226 pounds. The others consisted of 1 featherweight, Ishikawa; 2 lightweights, Terlazzo and George; 1 middleweight, Stanczyk; and 1 light-heavyweight, Terpak. In the case of Terpak, he was really a middleweight and weighed but 3 pounds over the limit. Of all the light-heavyweights in the world only 4 have officially clean and jerked double bodyweight. No heavyweight has ever performed this wonderful feat of strength, or even come close to doing it. 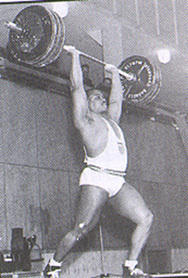 The great French champion, Rigoulot, weighing at 235 needed 475 pounds for a double bodyweight clean and jerk. I'm confident that this poundage was beyond his limitations. Manger, the former Olympic, World's and German champion, weighing at 250 pounds needed a clean and jerk of 500, but made 363 at his best under official conditions. Kutsenko weighing 237 needs 474 and I don't think he will succeed with this poundage. Louis Abele, a great American lifter, scaled about 218 pounds and 436 was not within his capabilities when he was active as a competitive lifter. His best lift during this period was 380 pounds. We can not forget the incomparable Steve Stanko, who I believe weighed in the neighborhood of 240 pounds in his last contest, but who usually tipped the beam at about 220 to 225 pounds. Steve registered 382.5 pounds in the clean and jerk in competition and is reported to have made 400 in training. Why do heavyweights find it impossible to scale this almost insurmountable barrier of double bodyweight in the clean and jerk? One obvious reason is the high bodyweights of the heavyweight lifters. The next reason is a rather lengthy one defending myself and the European "heavies." Excepting Rigoulot's accomplishments as a professional lifter, the highest poundage ever cleaned by a heavyweight, to my knowledge, is 405.5 pounds. The bodyweight of the lifter was then 199 pounds. He failed to jerk this poundage due to a lack of bodyweight and a slim (31 inch) waistline. Harry Paschal wrote in one of his articles that I appeared fat to him. This I don't deny. After the North American Championships this year, Arthur Gay wrote that I was "fat and out of condition." I don't know if he meant this literally. The purpose of my trip to Canada was to try myself out for the World's Championships. Without realizing it I had trained myself stale; hence the 880 pound total. Only 3.5 weeks later I totaled 123.75 pounds more! Now I'm sure we all realize that no one has a training system that can produce that kind of results in 3.5 weeks. My added bodyweight was for the specific purpose of making myself stronger. Everyone adheres to the theory that if a 132-pounder gains in weight, he gains in strength; likewise in the heavier classes. But if a heavyweight wishes to become stronger everyone immediately warns him against becoming "fat," lest he become slower and lest he might not look as well. But how is he to lift more weight if he does not gain in bodyweight and gain proportionately in strength? A featherweight could become a middleweight by adding a certain amount of fat to his frame. The amount of "beef" involved, not more than 15 to 20 pounds, is not enough to interfere with his speed. Well, then shouldn't this hold true with the heavyweights? In the case of the heavyweights, most of the fat accumulates around the waist and hips. Is a man with a thick waist better on the jerk than a man with a slim waist? I say YES! And I have two of America's most eminent authorities on the human body to support me on this statement. Harry Shafran and Charles A. Ramsey. Some years ago Mr. Ramsey pointed out to me that I could clean and jerk heavier poundages if I increased my bodyweight and the size of my waist. Mr. Shafran voiced the same opinion and likewise Mr. Wortmann, National Chairman of the A.A.U. Weightlifting Committee. But it wasn't until 1941 when I lifted a 1013 pound total that I realized what these men said was true. To understand this, you must first realize that physical strength potentialities of the human body are without a limit, provided you can continue to gain weight and keep your strength gains in proportion to your bodyweight gain. For example, Vaclav Psenicka, famed Czechoslovakian champion, was first the light-heavyweight champion of his country, making a total of around 800 pounds. Later, after putting on 50 pounds and weighing 230 pounds at a height of 5 feet 4 inches, he lifted in excess of 890 pounds and was reputed to have totaled 900 pounds. Among our present day body builders, including some of the "Mr. America" winners, we have men who, in spite of their trim muscular condition and impressive measurements, can't handle more than 275 pounds in the clean and jerk, or much more than 200 pounds in the press. To be a little more specific but to mention no names, one weighs in excess of 200 pounds and sports 18.5 inch biceps. Yet he is rumored to have pressed little more than 200 pounds and that with a definite back bend. Most of these fellows have 27 to 32 inch waistlines and comparatively few among them have clean and jerked 300 pounds. Stanko and Grimek are among the exceptions. While weighing 176 pounds I cleaned 371 pounds but could not jerk it because of a 29 inch waist. There just was not anything there to support this tremendous poundage. The missing of jerks in the early part of my lifting career was due partly to faulty style. But even when I corrected this fault I still missed jerks because of a lack of adequate bulk in my midsection. Tony Terlazzo, by no means a fat man, possesses a thick waist for a man of his size and bodyweight. His waist normally measured about 32 inches. Tony succeeded in clean and jerking 340 pounds. Jack Cooper could clean this same poundage, yet could not jerk it because he, too, possessed a 32 inch waist but he outweighed Terlazzo by 64 pounds. It has been pointed out that taking two tree trunks of the same height, one being broad and thick and the other being slender, the former will support more weight than the latter. The same holds true with human beings. A thick, heavily built torso will support more weight with less expenditure of energy than will the well muscled but slender torso. A moderate accumulation of excess fatty tissue certainly is not detrimental to a heavyweight lifter. I don't know if Stanko believed in this but he carried a few pounds of excess weight when he was a competitive weightlifter. Abele, Geissa, Mayor, Schofro and Kutsenko all have large waistlines. When participating in lifting contests these noted heavyweights were carrying from 15 to 30 pounds of excess weight. They were not sloppily fat or out of condition either. Because of my unorthodox or inconsistent performances in competitive lifting, I have been called everything from "lazy" to "fat and out of condition." To explain as briefly as possible about my output of energy - I would not consider paying $5,000 for a new car if I knew I could purchase it for $2,500. Likewise, in a contest I would not total 1,000 pounds if I knew or realized I could win with 800. Of course, the importance of the contest has considerable influence on my efforts. There seems to be an insatiable, uncontrolled desire among lifting fans to see records surpassed at every contest. I can hardly blame them for I, too, like to see records broken. But most of these enthusiastic followers of the "iron game" seem to be of the opinion that I can break them at will. This is certainly not always the case. My apparent disinclination to break records is due to the following reasons. During the 10 years I have been lifting I have broken and re-broken records, national and world's records alike. At one time or another I have held all of the records in the light-heavyweight and heavyweight divisions - without recognition. It seems that I can gain possession of records only during international competition, and even then I can't be sure of acceptance. I have only the personal satisfaction of having accomplished difficult feats. In my humble opinion, these are sufficient reasons for lifting only enough to win in a contest. It has been said that I lift better when faced with stiff competition. This is not necessarily true. The situation, as I see it, influences my lifts and my final total. My attitude may not coincide with the general attitude prevalent among athletes and their followers who continually call for "blood." But it is my attitude and as yet I have not felt inclined to change it. I hope this serves to answer all of the questions that have been asked of me regarding my physical condition, my attitude towards lifting and the extent of my competitive spirit.